Chord NOTE 2.0.1 & Guitar Kit 2.1 released! PET Bottling 1.1 has released! Percussion app “PET Bottling” for iPhone / iPod touch update to ver 1.1! Currently play sound ever ring/silent mode. Supported iPad natively. Currently PET Bottling is Universal app. Replaced to new memory management system. 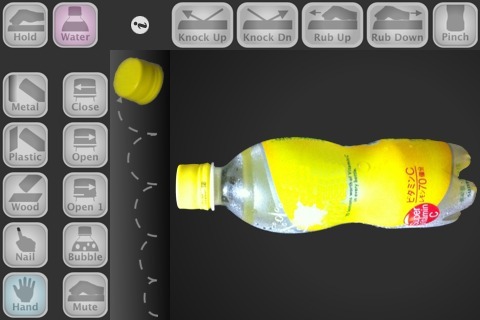 Now you can show Grid on bottle image for position changing sound clearly. Now you can show indicator for playing sound. Now you can set tilt sound of Water Mode to OFF. Supported Landscape Left and Right too. (PET Bottling recommend lock rotation of your device in Control Center, if you use tilt sound of Water Mode. Replace to new sound engine. Now you can change “Tapping Object” by sliding your finger too. Remove unwanted tail noise for many samples. Optimized for all device’s screen size. Changed to modern architecture and use modern API. Added scrollable more detailed help text.